The Ravens were the most confounding team of 2018. The team started out with a reasonable, if predictable offense, with three receivers and a pair of running backs who were all relatively productive if unspectacular. But then a midseason switch to Lamar Jackson at quarterback turned everything on its head. Baltimore went from a team with a slightly below-average run/pass mix to the most run-heavy offense we’ve seen in some time. Even more frustrating from a fantasy perspective? The team didn’t have a “guy.” In any given week, it was nigh-on impossible to know who was going to lead a given position in fantasy scoring. Five different running backs led the Ravens in PPR scoring in a given week. Three wide receivers. Four tight ends. Mark Andrews’ late-season cementing as the No. 1 tight end aside, guessing which Ravens skill player to use in a given week was a crapshoot. So the biggest question for 2019 in fantasy for this team is: Can we figure anything out? The Ravens are surprisingly well set up across most of the roster. The team had one of the league’s best defenses in 2018, and while there are components of it that are heading into free agency, there is enough there that the team doesn’t have to go crazy rebuilding that side of the ball. The team is well stocked with potential at tight end, with two rookies from the 2018 draft. But at receiver, things get hairy. 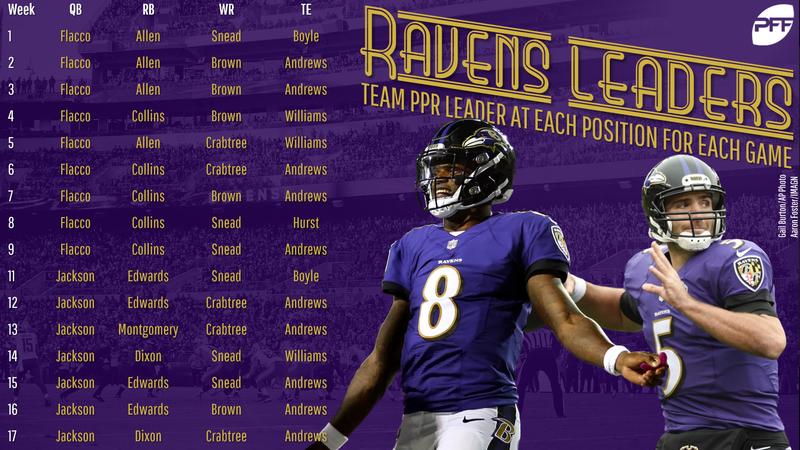 Baltimore had three primary contributors at wide receiver in 2018: John Brown, Michael Crabtree, and Willie Snead. The three finished with 12 PPR points of one another and each led the position in PPR scoring five times (Snead notched a sixth). But Brown is a free agent this offseason, while disappointing 2018 addition Crabtree is a potential cut. Snead is likely back with the team for another year but isn’t enough to carry a receiving corps on his own. Enter a 2019 rookie. Steve Palazzolo’s recent mock draft has Arizona State’s N’Keal Harry going to Baltimore at 22nd, which makes sense for Jackson given Harry’s range. But whether it’s Harry or another receiver, the Baltimore first-rounder should be a pass-catcher, and that pass-catcher would immediately carry plenty of fantasy intrigue. Immediately, I’m going from wanting clarity in the team’s approach to muddying the waters. Nonetheless, bringing Collins back makes sense. He’s a year removed from finishing as a top-20 PPR back and PFF’s top-graded rusher despite only getting the team’s No. 1 job at midseason. While that was probably over his head, his cratering in 2018 (3.6 yards per carry, 2.3 yards after contact per carry) is lower than we should expect as well. More importantly, the two players we can more confidently count on being in the Baltimore backfield in 2019 carry big question marks. Gus Edwards came out of nowhere to be a relevant contributor after Jackson took over, but his lack of pedigree (he was undrafted) and receiving chops (he had two targets all season) make him a crapshoot. And while Kenneth Dixon has been as elusive as they come (leading the league in forced missed tackles per touch in both of his healthy pro seasons), it’s that “healthy” caveat that is important with him — he’s been on injured reserve each of the last two seasons. Bringing back Collins wouldn’t be a fantasy game-changer but would provide insurance at a position with a lot of question marks. Taylor spent his first four years in Baltimore backing up Joe Flacco, and a 2019 reunion makes sense (from my perspective) for both sides. With Flacco almost certain to move on this offseason and Robert Griffin III a free agent, the Ravens will need a new backup to Jackson. Taylor had a disastrous (short) tenure in Cleveland, but he was a perfectly competent quarterback in Buffalo. Backing up a similarly styled (if much better) quarterback like Jackson would make sense. The dramatic change in style from the switch to Flacco to Jackson complicated matters in Baltimore, and the difficulty of a switch back might have been a contributing factor in letting Jackson finish that playoff game against the Chargers. Taylor can fill in for Jackson in a pinch but isn’t so prominent at this point that he would be considered a replacement if things go south.